The owners of the Burns Lake sawmill that exploded Friday, killing two workers and injuring 19, won't say whether they plan to rebuild the facility that has been described as the lifeblood of the small town. At a heated town hall meeting in the small community Monday night, Hampton Forest Industries CEO Steve Zika told the crowd that the future of the Babine Forest Products mill depends on B.C. 's lumber supply. "Only with a secure midterm timber supply will it be feasible to rebuild a new sawmill," Zika said. "Government has already committed to fast-track an evaluation of future timber supply. With the damage from the mountain pine beetle, this is a very difficult question and is the key factor around rebuilding a sawmill in Burns Lake." Estimates for damage caused by the unexplained blast and massive fire have been coming in at as high as $100 million. For B.C. mills destroyed by fires in recent years, rebuilding has been rare. When a Prince George plywood plant was ruined in 2008, Canfor used the insurance money to upgrade mills elsewhere. The Tolko mill at Louis Creek wasn't rebuilt after it was levelled in the McLure wildfire in 2003, either. Sadness and anger about the disaster were evident at the public meeting, as some mill workers and townspeople said they worried that without the mill, Burns Lake would become a ghost town and its residents would be left high and dry. But others said that past safety concerns suggest that if the mill is rebuilt, it should operate under new management. Mounties say authorities are investigating the safety concerns raised by workers, and officers have been interviewing everyone who worked at the mill, both about the day the fireball erupted and before. Const. Lesley Smith says some people have raised worries about safety and those are being passed on to investigators with agencies such as WorkSafe BC and the B.C. Safety Authority. Those agencies have said past safety audits of the mill are subject to privacy laws and can't be released until they've been vetted to ensure they are scrubbed of anything that might violate those laws. A significant fire shut down the mill last year and one worker says he and two colleagues had to put out a small blaze recently with nothing but fire extinguishers and garden hoses. Some residents of Burns Lake say that last week's tragedy is just another example of how small, remote communities have been left behind by the B.C. government. 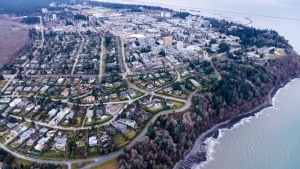 In a visit to the small town on Sunday, Premier Christy Clark vowed support for the community, and on Tuesday, the government announced that a rapid-response team has been formed to concentrate on economic recovery. Jobs, Tourism and Innovation Minister Pat Bell will also travel to Burns Lake on Friday to meet with community leaders. But one Burns Lake resident, Valid Kennedy, told Monday's town hall meeting that the government response has been too little, too late. "It's kind of heartbreaking when something of this kind of devastation, the magnitude of it, wakes up Victoria and the federal government," Kennedy said. "Why does it have to take this kind of stuff for you guys to really act and listen to the grassroots people?" Investigators have now located the remains of two people in the debris left by the blaze, although they have yet to identify the bodies. Mill employees Robert Luggi and Carl Charlie have been missing since the explosion and are presumed dead. The mill is located about 220 kilometres west of Prince George and employs about 250 people. An explosion at a sawmill in Burns Lake, B.C. Friday night has left at least 29 people injured, some with severe burns, and three people unaccounted for, hospital and police officials say.